- If you hit SHIFT shortly, then you switch on/off the walking mode. - There's an 'I'll be walking and not running, if you use the cursor keys!' icon on the screen, when Lara will be walking with the cursor keys. 1. The player hits left or right SHIFT (and holds it pushed down), so if (s)he uses the cursor keys Lara will be walking and not running. A 'walking person' icon shows up in the bottom right corner of the screen. 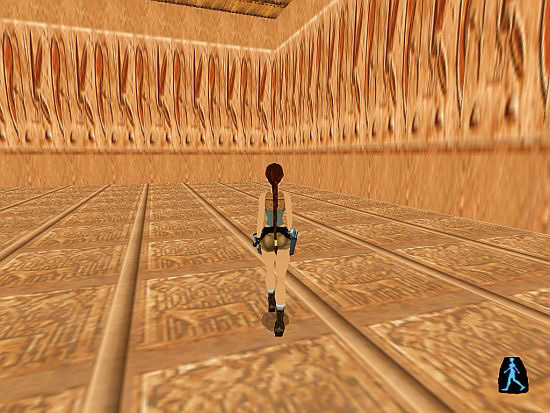 - Then the player releases SHIFT so Lara will be running again with the cursor keys, and not walking. The icon disappears. 2. The player hits left or right SHIFT, then releases it at once. With that, the player switched on the walking mode. I.e. Lara will be walking if the player uses the cursor keys, either (s)he presses SHIFT continuously after the switching-on or not. The 'walking person' icon shows up. To switch off the walking mode, the player must hit left or right SHIFT again, shortly. The icon disappears. - Use NG Center\Tools\Sprite Editor: load your WAD, choose CUSTOM_SPRITES, then import the person icon picture, for example, into Texture0 slot. Click on 'Exit and Save WAD', save on the SWD of your WAD, then quit. Using Image Script command you can use another method for the icon and not the method of a sprite. This tutorial skips discussing Image version. I'll show you two setups now. The first setup is the easier one - it's recommended to beginners. The second setup is the complicated one - it's recommended to advanced builders. 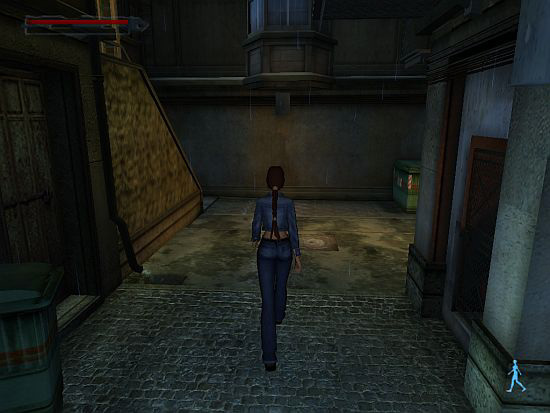 - press SHIFT+right arrow or PAGE DOWN to make Lara step right. In Setup#2 we use NumPad1(End) to step left and NumPad3(Page Down) to step right now - but feel free to choose other keys. The usage of SHIFT and the usage of Step Left/Right keys are not the same in Setup#2. That would be illogical if they did the same thing. So, when you hit Step Left/Right key then the icon appears (except: the icon has placed on the screen before, i.e. the walking mode is just on), and if you release Step Left/Right key then the icon disappears (except: the icon remains on the screen now, because the walking mode is just on). This 'Parameters' command says the sprite (picture) in the Texture0 slot of CUSTOM_SPRITES (i.e. the person icon) will show up in the '880, 860, 110, 110' position on the screen if you call this PARAM_SHOW_SPRITE=1 entry in the game. - First method: if Lara is ready to walk in the usual way (i.e. if the player is just holding pressed down left/right SHIFT) or if she's just walking by DELETE/PAGE DOWN. - Second method: if the player has just switched on the walking mode by hitting key Z. The first method uses GlobalTrigger#1: if the condition is true (i.e. if the player uses left/right SHIFT or DELETE/PAGE DOWN, see TriggerGroup#1) then the icon will appear (see TriggerGroup#2), or, if that's not true, then the icon will disappear (see TriggerGroup#3). This trigger makes Lara walk if the player uses the cursor keys without SHIFT pressed. Thanks to FO_LOOP in the Organizer, this command will be sent again and again (until the Organizer stops) so the walk will be continuous. See more about the contents of the Script in NG Center\Reference. 2. The icon will always show up if you use the keys to walk. So even when it's not logical: when Lara's climbing a ladder, swimming in water etc. But it doesn't disturb the gameplay, moreover, it's helpful a bit: for example, if you see the icon (because you've switched on the walking mode) when Lara's swimming then you will know that Lara will be walking after she climbs out of the water, and not running. But don't forget: Lara does special movements if SHIFT is just pressed. - For example, she doesn't perform a simple jumping forward but performs a swan dive if you also hit SHIFT with ALT+up cursor keys. That's why, if you hit ALT+up, but the walking mode is on then Lara will perform a swan dive. - Thread#2: if the player hits Step Left/Right keys. 0: this is the default state: the SHIFT hasn't been pressed, the walking mode is off. 1: the walking mode switches on, because the SHIFT has been pressed shortly and the walking mode has just been off. 2: the walking mode switches off, because the SHIFT has been pressed shortly and the walking mode has just been on. 3: the SHIFT has been pressed continuously, but the walking mode is just off, so Lara will be running and not walking now if you hit the cursor keys. 4: the SHIFT has been pressed continuously, but the walking mode is just on, so Lara will be walking and not running now if you hit the cursor keys. - Naturally, it's a useless activity of the player: why does (s)he press SHIFT continuously when the walking mode is on? That pressing is absolutely senseless: Lara would walk without that long pressing, all the player should do is press the cursor keys now. The 'timer' starts from 0. - If the walking mode is just off (so if Local Byte Alfa1=0 now) then Local Byte Alfa1 becomes 1 now. If the player releases SHIFT maximum after being pressed 5 frames, then the walking mode will switch on. - If the walking mode is just on (so if Local Byte Alfa=1 now) then Local Byte Alfa1 becomes 2 now. If the player releases SHIFT maximum after being pressed 5 frames, then the walking mode will switch off. - If the walking mode is just off (so if Local Byte Alfa=1 now) then Local Byte Alfa1 becomes 3 now. If the player releases SHIFT now or later, then Lara will be running and not walking if the player hits the cursor keys. - If the walking mode is just on (so if Local Byte Alfa=2 now) then Local Byte Alfa1 becomes 4 now. If the player releases SHIFT now or later, then Lara will be walking and not running if the player hits the cursor keys. GlobalTrigger#1 activates TriggerGroup#2 if the condition in TriggerGroup#1 is true, or activates TriggerGroup#3 if that condition isn't true. c, subtracts 2 from Local Byte Alfa1 that means 'Lara's not walking and SHIFT isn't pressed, because Local Byte Alfa1=0'. b, subtracts 3 from Local Byte Alfa1 that means 'Lara's not walking and SHIFT isn't pressed, because Local Byte Alfa1=0'. - If Local Byte Alfa1=4 then the game subtracts 3 from Local Byte Alfa1 (see $2000, 233, $340 above) that means 'Lara's walking and SHIFT isn't pressed, because Local Byte Alfa1=1'. GlobalTrigger#2 activates TriggerGroup#5 if the condition in TriggerGroup#4 is true. GlobalTrigger#3 activates TriggerGroup#7 if the condition in TriggerGroup#6 is true. Of course, Setup#2 will be bothered if the variable value turns from 255 into 0. That's why we don't let GlobalTrigger#1 increase the value too high. No, it doesn't mean we'll stop the timer (because that disturbs the working of some conditions). Instead of that, we'll always subtract number 1 from Local Byte Alfa2 if GlobalTrigger#1 would like to step over a limit in Local Byte Alfa2. I adjusted this limit as the frame#8. So, if the player holds SHIFT down at least until 8 frames, then the game subtracts number 1 from those 8 frames. Then the variable value will become 7. If SHIFT is still down then Globaltrigger#1 would give another frame to Local Byte Alfa2 to be 8. But it is 8 again, so the number 1 will be subtracted again, and the value will become 7 again. Etc. Conclusion: if the player holds SHIFT down at least 8 frames long then Local Byte Alfa2 will become 7 continuously - until TriggerGroup#3 turns it into 0 when the player releases the SHIFT. It is GlobalTrigger#4 that does that subtraction: if the Condition in TriggerGroup#8 is true (i.e. if Local Byte Alfa2=8) then the game will perform TriggerGroup#9 (i.e. subtracts 1 from Local Byte Alfa2). See more about the variables in the Variables demo project of Paolone. In this thread, GlobalTrigger#5 activates TriggerGroup#12 if the condition in TriggerGroup#11 is true, or activates TriggerGroup#13 if that condition isn't true. This time we can't call PARAM_SHOW_SPRITE=1 Script entry to put the icon on the screen, because that would disturb the working of Thread#1. Instead of that, we'll call PARAM_SHOW_SPRITE=2 Script entry to put the icon on the screen. This entry contains exactly the same data as PARAM_SHOW_SPRITE=1 contains. That's why PARAM_SHOW_SPRITE=2 also puts the 'walking person' icon of Texture0 slot on the screen, and also on the '880, 860, 110, 110' coordinates. (So, if the walking mode is off, then the game puts the same icon in the same position as if the player hit SHIFT. - It is logical.